Our Cork Life Drawing address: Visions School of Art, Long’s Yard, Tower Street, Cork. Practice Sessions: Mondays 7pm – 9pm; you can join the sessions on any Monday! Book 5 sessions ahead for EUR 50.00, to be taken within 6 weeks, or you can drop in for EUR10.00 per session (or book 5 sessions for EUR40), upon presentation of a student card. A fee of EUR20 for non-students/unemployed for drop-ins. Long-pose practice sessions also take place once per month on a Saturday, 2pm-7:30pm – EUR45 for the day. Introduction to Life Drawing: an instructed course on the fundamentals – Tuesdays 7pm-9pm – see here for the next scheduled begin-date for this course. also ‘Like’ and Share our ‘Visions Life Drawing Cork’ Facebook page here to get updates and news on your Facebook News Stream. 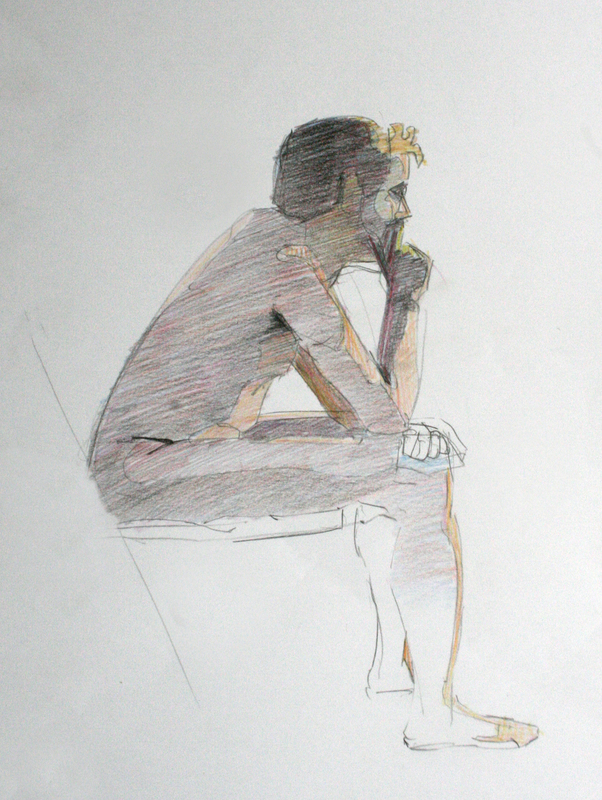 Life Drawing is one of the fundamental skills that Artists need to practice and gain an understanding of – learning and practicing drawing the figure is truly a strong foundation upon which a solid artistic development can blossom. Visions is now offering Cork Life Drawing classes and practice sessions at our premises at Long’s Yard, Tower Street, Cork City. Introductory, instructed courses are 6 weeks in duration, and are €90 to book for the cycle. The course – ‘Introduction to Life Drawing’ – covers the fundamental skills and concepts that every artist needs for approaching drawing the figure. It is not just suited to beginners, therefore, but functions as a primer for those with more experience and knowledge, who may want to upskill or refresh their understanding of the discipline. Our Cork Life Drawing practice sessions are €50 to book for 5 sessions, but you will have 6 weeks to take the 5 sessions, for flexibility. Students, however, may attend on a drop-in basis, and it will be EUR10.00 for students upon presentation of a student card. Practice sessions are open to anyone, from those with less experience to professional artists wishing to keep their hand in. Although our Cork Life Drawing practice sessions are not instructed, it is always possible to pick up tips and insights through break-time conversation with other participants, who may have more experience with a certain (or all) aspects of drawing from a model. Cork Life Drawing: Who Can Do It? It is our personal view that ANYONE can learn the basic tenets of good draftsmanship through the practice of Life Drawing. Again, as is my outlook with teaching any dimension of Art, our Cork Life Drawing classes are instructed with a learner-centered approach; this means that anybody – from complete beginners to more advanced students – can attend classes, and students will make progress from the level of experience and capability that they have at the beginning of each session. Please contact Andrew (contact details here) to express interest or to book a place. Directions to Granary House on Rutland Street can be found on the same page. A3 Sketchpad (or sheets of A3 cartridge paper – don’t get any paper that is shiny as this indicates it is cheap and has plastic content), a newsprint pad for each class (Cork Art Supplies stock “Skizzenblock” by MalZeit Newspaper), Drawing Clips x 2 (Bull Clips or other, to fit a 6mm drawing board thickness), 2B, 5B and 8B grade pencils, a sharpener and a plastic rubber (Cork Art Supplies,again), an A3 art bag for storage of completed drawings.